Which of Dredd's pals would you put on the silver screen? Over on io9 in today’s Morning Spoilers there is an item quoting Duncan Jones, the director of Moon, Source Code, and Warcraft about the possibility of making a superhero movie. The Bowie boy blazes his Beckenham roots by declaring that he would be interested in filming some characters from 2000AD. 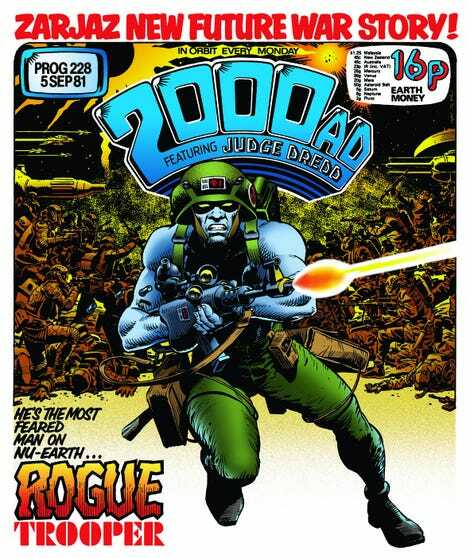 Not Judge Dredd, mind you, but genetically engineered soldier Rogue Trooper or Celtic head-trip Slaine. He bemoans the fact they don’t have the required fame to secure a movie budget. I think I face the same problem with my Big Fat Bokko movie. But I kinda feel like where my heart lies, if I were gonna go in the comic book direction, it would be in the British stuff just because I am British. So 2000AD where Judge Dredd came from, has an amazing cast of characters. And I think if I were ever gonna do a comic book character, it would probably be one of those. Dredd was great, but there are like Slaine, and Rogue Trooper, and all of these amazing British characters that are over here, people don’t know about. So if I can find a way to get the budget to do one of those, which is difficult because they’re not known about… Those would be amazing movies, it’s just because they’re not known about. How do we make that work? But we’ll see. I would rather focus on trying to do a 2000AD character. Before I hit him with an old copy of Buster and say what about Galaxus, I have to admit a Rogue Trooper movie sounds like a great idea. Apart from the comics, didn’t the character storm the charts as a record breaking game? Created in 1981 by Gerry Finley-Day and Dave Gibbons, Rogue Trooper is the story of a blue-skinned genetically engineered super soldier. He’s a GI or Genetic Infantryman. I have it in my mind that it was created at a time when Fleetway expected Battle to merge with 2000AD. Or was that The VCs? Anyway, lots of scope for action scenes, explosions and stuff. Rogue wandered the wastes of nu-Earth carrying dog-tags with back-up personalities for the rest of unit who had already been killed. Though thinking through 2000AD’s stable of characters, Halo Jones, Skizz, Strontium Dog, Sam Slade, and others call out for movies. Slippery Jim deGriz even. But I think I would go for The Mind of Wolfie Smith. Not to be confused with Robert Lindsay’s revolutionary, Wolfie was originally written by Tom Tully for Tornado which featured Dave Gibbons as Big E. Drawn by Vincente Vaño the strip continued in 2000AD post merger. It’s teen protagonist, Ernest Patrick “Wolfie” Smith found that ESP and telekinetic powers set him apart from his peers. Circumstances force him on the run and into sundry perilous situations. The tone of the strip darkened up somewhat after it became part of the 2000AD stable. It’s something that could be filmed in a contemporary setting and many effects could be created in camera rather than with excessive amounts of CGI. That’s my choice though. What would you pick? Exclusive: We talk MUTE, WARCRAFT and Superheroes with Duncan Jones.